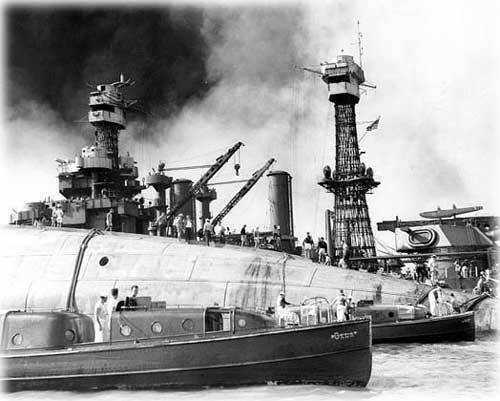 Capsized Hull of USS Oklahoma; Pearl Harbor Attack, 7 December 1941. Ensign Irvin Thompson, 24, of Ketchikan was lost in the sinking of the battleship Oklahoma. Thompson was Alaska's first serviceman casualty of World War II. Official U.S. Navy Photograph, now in the collections of the National Archives. REMEMBER PEARL HARBOR: Dec. 7, 1941 By JUNE ALLEN - It was Sunday morning, Dec. 7, 1941. At 7:55 a.m. Hawaii time, Japanese Imperial forces launched a surprise air attack on the U.S. Navy's fleet moored at Pearl Harbor and the nearby Army installation. Nineteen ships were sunk or damaged, crippling the U.S. fleet. And in a period of only a few hours, 2,300 Americans were left dead. One of those was Navy Ensign Irvin Thompson, 24, of Ketchikan. He was lost in the sinking of the battleship Oklahoma, Alaska's first serviceman casualty of World War II. In his honor, flags would fly at half-mast throughout Alaska Dec. 21, by proclamation of Territorial Governor Ernest Gruening. In spite of the fact that the United States had declared neutrality in Hitler's "European war" on Sept. 5, 1939, most citizens expected that eventually the country would be drawn into the conflict. What few expected was that any nation would dare to attack the United States! The attack on Pearl Harbor came as an outrage and war was immediately declared. National: Bush tries to persude public that economy is strong By BILL STRAUB - The Bush administration has grown increasingly flummoxed over the public's sour view of the nation's steadily growing economy, but critics say that despite the rosy picture painted by the president, America's middle-class families are struggling. Recent polls, including one released by Gallup in mid-November, show that most Americans don't share the administration's enthusiasm for the direction in which the economy is headed. That survey found only 37 percent assessing the nation's financial portrait as excellent or good while 63 percent rated it good or poor. National: Abramoff scandal's many tentacles reach far and wide By MARGARET TALEV - The plot is over the top and ever-expanding, and the cast of characters so convoluted you'll need a map, a calculator and a wall chart to keep up. Lobbyists. Indian tribes. Casinos. Religious conservatives. Anti-tax crusaders. Tens of millions of dollars. Dubiously timed legislative actions. Speculation about widespread political corruption. Suspect charities and incriminating e-mails. Tentacles to the White House and the campaign coffers of more than 100 former and current members of Congress. Cameos in the Pacific, West Africa, Scotland and Israel. The mob and a gangland murder in South Florida. A congressional investigation led by a senator with an eye on the presidency. And teams of federal prosecutors going after the goods. Thursday , December 08, 2005 - The Ketchikan Legislative Liaison will meet at noon in the City Council Chambers to discuss community projects and a fly-in to Juneau. The meeting is open to the public. National: Mantle of scandal worn by GOP was Dems' a decade ago By ZACHARY COILE - Republican leader Newt Gingrich helped the GOP recapture the House in 1994 by portraying Democrats as too corrupt to lead after a series of scandals that led to the resignation of some of the party's top leaders. National: Justices push law schools to defend Pentagon recruiting ban By MICHAEL DOYLE - Law schools faced tough questioning Tuesday as the Supreme Court considered how much assistance the schools must provide military recruiters. National: Moussaoui's lawyers submit proposed jury questionnaire By GREG GORDON - Have you or a member of your family ever served as a firefighter, rescue worker or commercial pilot? Do you live near the Pentagon? Do you have an initial reaction when you learn that a person is of Muslim or Arab descent? Alaska: Alaska firms use 'big guns' to catch fishing rights - Alaska fishing companies are mounting an intense lobbying battle in Washington to try to lock up Bering Sea commercial fishing rights worth millions of dollars. Alaska: Diversified Folds Alaska Fisherman's Journal into National Fisherman - Diversified Business Communications announced Tuesday that it will fold its regional commercial fishing magazine, Alaska Fisherman's Journal, into its flagship publication, National Fisherman.